They were brothers, so we were told. Bigger than any other cheetahs I’ve seen before, but then again the few others I’ve seen were far in the distance, teasing us by skulking in the bushes, almost out of sight. These boys were close-by. They were very close by. My husband and I were enjoying the good safari life at Amakhosi Safari Lodge in northern KwaZulu Natal. We were there as guests of Africa Geographic being spoilt to a weekend away as their client. We were soaking up the Zululand bushveld and all its wild offerings while being in good company too. 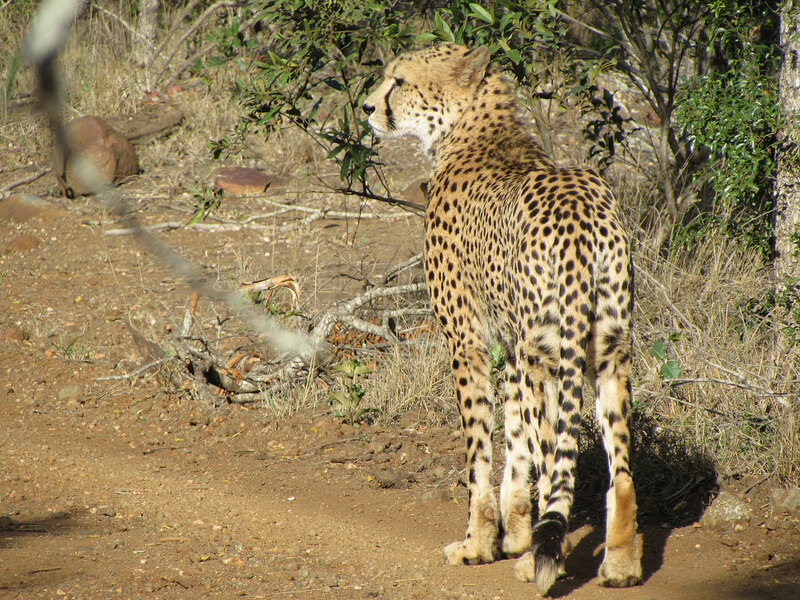 We followed that cheetah duo as they wandered up the road, peering back at us as if to say “follow us.” They didn’t have to ask twice. They were on the move, almost trotting up the path in front of us, very alert. Suddenly the sound of a twig breaking caught their attention in the bushes to the right. In unison they were off. They were completely in tune with each other. Our guide was as excited as we were. Exclaiming and grinning as he told us, they are on the hunt! He anticipated their next move and the best route to take as we all held our breath and had cameras ready for any action. The brothers had moved deep into the bushes, where no vehicle dared to tread. We drove around to where our guide thought they may pop out. There we met up with the other Amakhosi safari vehicle which was out on their morning game drive too. They had just seen the cheetahs too… and they had been chasing a cat! Not a wild cat! A common variety, fat and cuddly house cat. We didn’t see it with our own eyes but believed all the wide eyed guests in that car. Usually we would have thought they had imagined it and had overdone the Amarula in their morning coffees that day but we were all parked at the scene of the action and it happened to be just outside Amakhosi’s owners’ home, set in the reserve near the lodge. Inside the fence bordering that home was one of the cheetahs. It was a bizarre fusion of residential meets African wilderness. The cat had got away but now the cheetah was uncomfortably trapped inside a territory he had jumped into, unwittingly. He paced around and around while his brother called to him from outside, separated by mesh. This was something we’d never seen before. We stayed with the brother outside the fence as he also walked up and down calling. It was endearing actually and the bond between the two was clear. They were not impressed at being separated. After a few minutes, once the garden gate had been opened by the other guide, the cheetah made his way out and was reunited with his boetie. They trotted off in search of their next adventure, leaving us giggling at them and grateful for the show. I think the cat was grateful for their exit too. That wasn’t’ the only wild moment we experienced while out on game drives at Amakhosi. The reserve the lodge is set inside is Big 5 territory and we were amazed at just how chilled out the wildlife was. They seemed to welcome the safari vehicles into their daily lives and show off for us inside them. It was a treat to observe them so close up but also seeing that we were not unsettling them with our presence. Find out more about Amakhosi Safari Lodge on their website. This blog was originally posted on the This is KZN website.